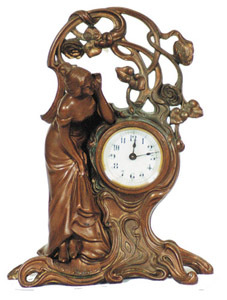 Ansonia Clock Co., metal novelty, "Bower", ca 1906. Originally was bright gold gilt, now worn down to a dull bronze or copper. Special 2 ended key to wind and set the hands from the back, key comes with the clock. It is probably 8 day, time only, and runs. Porcelain dial is signed, beveled glass, case is 9 1/2 inches high. Unusual novelty. The lady took a lick on her nose and had a nose job to get it back right. Ly-Ansonia No.2289.